South Korea has been recognized by the World Food Programme for its active aid to poorer nations, years after being on the receiving end of international help. 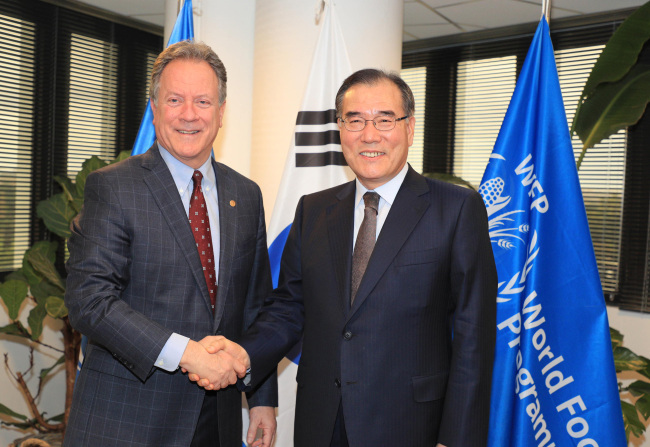 In an interview with Yonhap News Agency on Tuesday, South Korean Agriculture Minister Lee Gae-ho said he received the plaque of appreciation from WFP Executive Director David Beasley in Rome the previous day. South Korea signed an agreement with the WFP last year and shipped out 50,000 tons of rice to war-torn nations such as Yemen and Syria. South Korea itself had been a recipient in the post-Korean War years, and Lee said no other country has successfully transformed itself from a beneficiary to a donor. "It was an emotional moment for me to receive the plaque from the WFP on behalf of our people," Lee said. "I recall taking the WFP's food aid as a child. And it's an honor for our people to be so recognized by the international community for having put such a history behind us and having become a donor nation." According to the WFP's list of donors in 2018, South Korea ranked 17th in the world with nearly US$68 million worth of donations. Lee acknowledged that South Korea, given the size of its economy and its standing in the international community, should be donating more food. "We'll have discussions with relevant government authorities and find ways to increase our food aid," Lee said. "I've heard that the quality of Korean rice is so good that people in the receiving countries all enjoy it."